Do you have teeth that have been severely damaged due to tooth decay or trauma? If the damage can’t be fixed with a basic dental filling, then you might consider the advantage of restorative dentistry to improve the strength and appearance of each tooth. 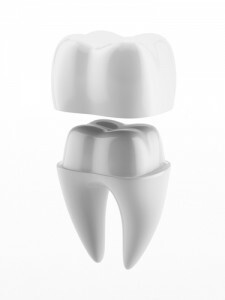 Dental crowns offer a great treatment option that can be used for many of our patients. Here at Clock Tower Dentistry, we are always working hard to provide the best dental services to our patients. When it is time for a dental crown procedure in Palatine, IL, we invite you to schedule an appointment in our dental office. How do you know if it is time for the dentist to put crowns for teeth in your mouth? The best thing that you can do is talk to our experienced dental team to learn more about recommendations for your situation. Each patient is unique, and we are happy to adjust the services to match your preferences. Many times, this treatment is used to save a tooth instead of using extraction to remove the tooth. When a tooth has been severely damaged, it is essential to strengthen that area of the mouth to prevent additional damage and pain. One of the benefits of dental crowns is that they can be shaped and colored to match the natural appearance of your smile. If you are not satisfied with the appearance of your smile, then you need to talk to our team at Clock Tower Dentistry about how crowns can be used in your treatment plan. Dental crowns offer a long-term solution that improves both aesthetics and function of the tooth. Here at Clock Tower Dentistry, we want to help our patients create beautiful, healthy smiles. When you are ready to learn more about the services that are available, we invite you to contact our team to schedule a consultation. Visit our dental office for access to the best dental treatments in the area!